Three people have been arrested on suspicion of the murder of missing teenager Sarah Benford. Northamptonshire Police are now searching the grounds of a house in Kettering for the body of the 14-year-old. Sarah, originally from Kettering, went missing from a care home in Northampton more than three years ago. 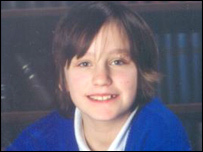 Last month police announced the search for Sarah had become a murder inquiry, because they had no proof she was alive. On Thursday, a police spokesman said officers had arrested a 54-year-old man at a house in Kettering and a 43-year-old man and 38-year-old woman at an address in London. Officers are now searching both properties. They are using ground-probing radar in the garden of the house in Kettering. The police have confirmed they are searching for a body. Detectives investigated 190 possible sightings of the teenager across the country, but believed she was too vulnerable to have survived on her own for more than three years. Sarah's photograph was put on 10 lorries, and her face was used to relaunch the National Missing Children's website in March last year. Her case was highlighted on BBC's Crimewatch in May this year.